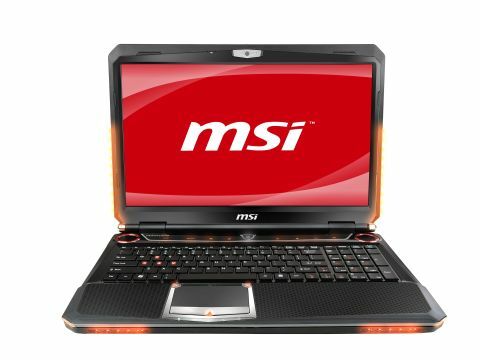 MSI produces a broad variety of laptops, from award winning netbooks, such as the Wind U160, right up to powerhouse gaming laptops, such as the GX660R on test here. Performance-wise, the GX660R is a monster. Everyday applications are blitzed by the quad-core Intel Core i7-720QM processor, while the AMD Mobility Radeon HD 5870 graphics card offers comprehensive performance for running the latest games at full whack. Where the GX660R really impressed us was the carefully implemented designs and impressive feature list, with many inspired by the work MSI does with professional gaming team it sponsors, Fnatic. A new look has been implemented for the GX660R, which you'll either love or hate, and embedded in the chassis are the high-end Dynaudio speakers, which you may recognise as the same manufacturer that built the sound system in your Bugatti Veyron (or not, of course). All-in-all the GX660R is a great machine, with the only blemish on the copybook being the slightly suspect keyboard, which is disappointingly unresponsive and rattly.